Have you considered a Hershey Candy Fundraiser? Fundraising candy has been a best seller for years and now Hershey's has introduced this new variety pack where each item sells for $2 but is much larger than the small vending machine bars. This new $2 Hershey Candy FundraiserVariety Pack offers bigger bars, the biggest brands and the biggest profits. These candy bars are much larger than the $1 candy bars. They are easy to sell and they offer higher profits than the old Hershey fundraising candy was. You get 8 Hershey’s Milk Chocolate with Almonds, 8 Kit Kat, 8 Reese’s and 6 Twizzlers in each carrier of candy. There are 4 carriers of candy in each case. That means you get 120 candy bars per case. 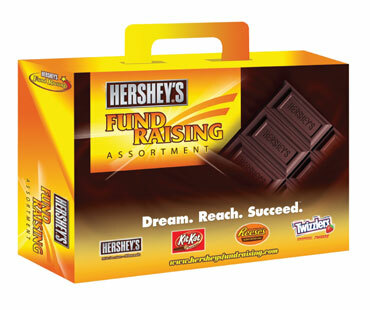 Hershey Candy Fundraisers are great for any sized group because the minimum order only 1 case. Shipping is FREE.